The father of the Orlando nightclub shooter has given several interviews to major news outlets in the wake of his son’s attack on a gay nightclub in Orlando that left at least 49 people dead and 52 others wounded. 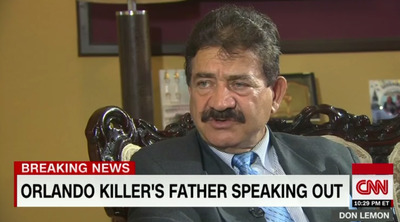 Seddique Mateen — an Afghan immigrant who settled in New York and relocated to Fort Pierce, Florida, with his wife and son in 1991 — has been heavily scrutinised for comments he made on Facebook on Monday in which he denounced his son’s actions by saying that it was up to God, and not his son, to punish gay people. Seddique, who is politically outspoken, has said Pakistan’s military-run intelligence agency (ISI) is the “creator and father of the world’s terrorism.” He is also heavily critical of Afghan president Ashraf Ghani, and has his own YouTube channel on which he has expressed his support for the Afghan Taliban. He recently declared his candidacy for the Afghan presidency. “He thinks he runs a government in exile and will soon take the power in Kabul in a revolution,” CBS News’ Ahmad Mukhtar said, after watching and translating Seddique’s videos from Dari, a Persian dialect spoken in Afghanistan. On Sunday, Seddique told told NBC News that his son’s actions had “nothing to do with religion.” He said his son became angry when he saw two men kissing in Miami months ago, and he thought homophobia may have inspired his son to attack the nightclub. 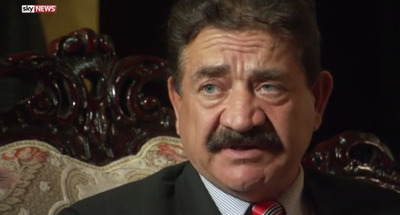 But reports that Omar Mateen had been attending the gay nightclub in Orlando, Pulse, at least once or twice a month for three years — and that he frequently reached out to men using several different gay dating apps — belies Seddique’s insistence that his son was repulsed by gay people. Omar also had gay friends: Samuel King, a drag queen, told The Daily Beast that he had befriended Omar while the two worked next door to each other in Fort Pierce. King said Omar Mateen had seemed generally accepting of the fact that he and his friends were openly gay. King said he even recalled him going at least once to the nightclub where King performed. Based on Seddique’s insinuation on Facebook that gay people will be punished by God, many have speculated that he may have projected his own bigotry onto his son — who may have internalized, repressed, and resented his own sexuality as a result. Omar’s ex-wife told reporters that Seddique “may have been gay, but chose to hide it out of anger and shame.” Her current boyfriend, who is Brazilian, told a Brazilian television station that Omar’s father accused him of being gay several times in front of his ex-wife before they divorced in 2011. 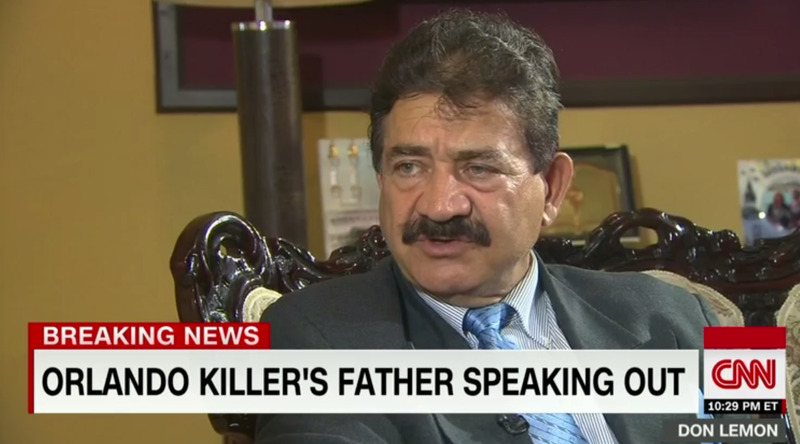 Screenshot/Sky NewsSeddique Mateen, Omar Mateen’s father, spoke to Sky News in an interview on Tuesday. In his interviews, Seddique has largely deflected responsibility for failing to recognise signs of erratic behaviour from his son. But Omar Mateen’s unpredictable flashes of anger and aggression have been confirmed by everyone from his ex-wife — she called him “bipolar” — to regulars at Pulse nightclub, two of whom said they stopped talking to him after he threatened them with a knife for making an offhand religious comment. Seddique largely echoed that sentiment on CBS. Seddique said the nightclub should share some of the responsibility for the massacre because it did not have good enough security. Omar Mateen, 29, was living in Fort Pierce, Florida, when he rented a car and drove to Orlando to carry out the attack on Sunday morning. He was armed with an AR-15 assault-style rifle and a handgun that he had legally bought days before. He was a security guard and had a Florida firearms licence that allowed him to carry concealed weapons. He called 911 during his rampage at Pulse and pledged allegiance to the Islamic State, while also expressing sympathy for the Boston Marathon bombers and an American suicide bomber who died fighting for Al Qaeda in Syria. He was investigated twice by the FBI in 2013 and 2014 for suspected ties to terrorists. The overnight shooting at the gay nightclub is the deadliest shooting in US history.